Located in Karnataka, Halebidu is home to some of the best examples of Hoysala architecture. Halebidu, a place which can be described in one word and that is ‘underrated’. Formerly known as ‘Dwarasamudra’ (Gateway to the Sea), Halebidu (the Old City) is an interesting page of ancient Indian glory and royalty. Situated in Hassan District of Karnataka Halebidu is legendarily known for its Hoysala architectural grandeur. Halebidu is just 16 kilometers from Belur and like Belur, it is also a former capital of the Hoysala empire. Another similarity it has with Belur is that it is also a temple town, boasting some excellent examples of Hoysala architecture. The most notable ones are the ornate Hoysaleshwara and Kedareshwara temples along with an architectural museum in the center. Halebidu is most known for its intricate architectural details. It will prove as a haven for anybody with an eye for detail. On the walls of the temples are hundreds of thousands of carvings and sculptures. No two sculptures are the same. The Hoysaleshwara temple is guarded by a Nandi bull which is incomplete, nevertheless just as beautiful. The temple is being proposed as a UNESCO world heritage site. Sculptures of Ganesha, Vishnu, Arjuna, Varahi and Vamana line the walls of the temple, all around the circumference. 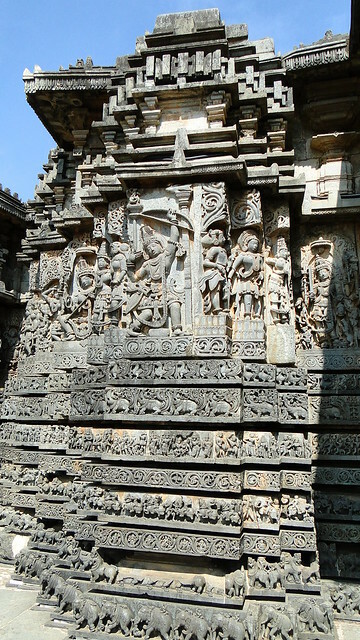 It also has a carving of battling elephants on the frontal end of the temple. The Kedareshwara temple has three main areas for worship; this is why it is also known as a Trikuta (a structure with three temples). In the temple compound vicinity there is also a Museum of Archeology where travelers can observe various figurines, coins, and inscriptions which are exhibited. This place is a rare mixture of history, beauty and knowledge. Visit Halebidu and see things that will never leave your mind. Do not forget to visit Veera Narayana Temple. It is situated in Belavadi, where Pandava prince Bheema killed the demon Bakasur. Do NOT throw away the prasadam you get in temples. If you do NOT want to eat it, do NOT take it. Halebidu has very limited accommodation facility; people prefer to stay in Hassan as they have luxurious facilities. Most restaurants are vegetarian. But both south Indian and north Indian delicacies are available.